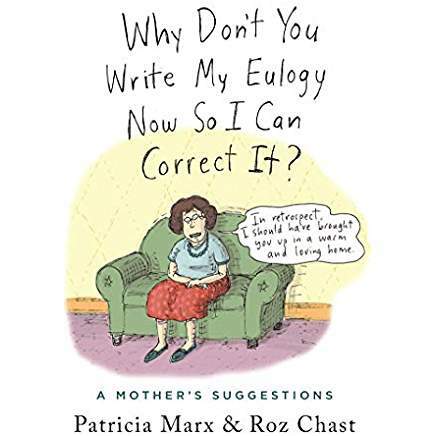 ThoughtGallery.org > Patricia Marx & Roz Chast: Why Don’t You Write My Eulogy Now So I Can Correct It? Patricia Marx & Roz Chast: Why Don’t You Write My Eulogy Now So I Can Correct It? 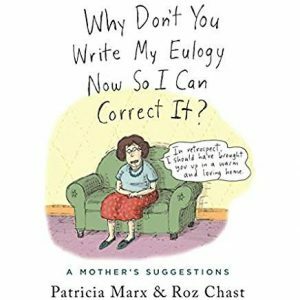 Come meet New Yorker writer Patricia Marx and New Yorker cartoonist Roz Chast as they talk about their latest book collaboration Why Don’t You Write My Eulogy Now So I Can Correct It? Every mother knows best, but Patty Marx’s knows better. Patty has never been able to shake her mother’s one-line witticisms from her brain, so she’s collected them into a book, accompanied by full color illustrations by Roz Chast. Patricia Marx has been contributing to The New Yorker since 1989. She is a former writer for Saturday Night Live and Rugrats, and is the author of several books, including Let’s Be Less Stupid, Him Her Him Again The End of Him, and Starting from Happy. Marx was the first woman elected to the Harvard Lampoon. She has taught screenwriting and humor writing at Princeton, New York University, and Stonybrook University. She was the recipient of a 2015 Guggenheim Fellowship. Roz Chast has loved to draw cartoons since she was a child growing up in Brooklyn. She attended Rhode Island School of Design, majoring in Painting because it seemed more artistic. However, soon after graduating, she reverted to type and began drawing cartoons once again. She is the author of Going into Town: A Love Letter to New York and Can’t We Talk About Something More Pleasant?